Mylene gets a call from Milia while she's in the shower. Milia tells her that she'll allow her to join the rock band Fire Bomber and will even send some jobs along her way if she agrees to look at a picture she's sending. Mylene is happy and teases her if she's supposed to kill the man in the picture. Milia says yes, by piercing his heart. Milia says that the picture belongs to Diamond Force's Gamlin Kizaki and that she's arranged an Omiai between them. Omiai is a Japanese custom (Chinese too from what I know) where people arrange two people to meet in the hopes of them ending up in marriage. Gamlin is seen working in his room's computer, trying to find out information about the owner of the red Valkyrie that likes to sing during battles. He discovers that it belongs to Basara and wonders how a civilian was able to obtain a top of the line VF-19. The protection level of that information however is 12 so he is unable to access it. He tries to get the serial number and manufacturing date but is met with a warning that any further attempts to access that information will cause his terminal to be disabled. His terminal is eventually wiped out as he tries to access the data. Mylene protests that she is too young (just 14 years old) but Milia says that she always complains that she's being treated like a kid. Milia ends the conversation by saying that their date is set for 2PM the next day and that she sent a nice dress for her to wear. Mylene strangles a large stuffed toy beside her in frustration. Basara flies his Valkyrie to their next gig in Mark Twain, one of the main ships in the Macross 7 fleet. On the way there he is bothered by the fact that he fired a missile to subdue an enemy Battloid during last episode's battle. Diamond Force, comprising of Lt. Kinryuu, Gamlin and Physica are taking out their Valkyrie's to test out the 20% enhancement made to the engines. On the way back Gamlin notices a shuttle travelling on the Milky Road highway because it flies differently than regular shuttles of that same class. The Milky road bridges the ships of Macross 7 together and allows the civilians to travel between ships. Gamlin queries the shuttle electronically for its model type and its value changes. Diamond Force concludes that it could either be a top secret military shuttle, a civilian craft or an enemy spy ship. Gamlin asks for permission to follow it, Kinyruu gives him permission then orders Physica to fly back with him to evaluate the results of their test flight. Probably noticing Gamlin on its tail, the mysterious shuttle craft suddenly speeds off to the Mark Twain ship in the fleet. Gamlin once again asks permission to pursue it, but since it entered a ship, it is no longer part of Diamond Force's responsibility. Kinyruu advices Gamlin that they'll request for a different team to handle it. Since it is also Gamlin's vacation time already, he asks if he can continue the pursuit on his own time and will hand it off to the other party once they arrive. Kinyruu agrees and gives him permission but teases him for being a workaholic. Gamlin checks out the hangar for the mysterious shuttle but doesn't find it. He's about to give up when he notices Basara's fire red Valkyrie parked in the hangar along with the other civilian vehicles. He informs the controller that he is going off duty now then changes his objective from looking for the enemy shuttle to looking for Basara Nekki. He ends up in the concert where Fire Bomber and a sling of other bands are performing. Fire Bomber had already finished their set and its members were sitting in the audience watching the other bands perform. 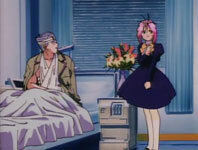 Both Ray and Mylene try to ask Basara what's been bothering him as his performance was not like normal. But he refuses to tell them anything. Flower Girl sees Basara and tries to give him the flowers but is blocked by a passing waiter. Gamlin then blocks her path and takes the seat beside Basara. Unknown to Gamlin is that the person he is searching for is sitting right beside him. As the last band finishes the lights suddenly go out. He asks Basara if the show is over, Basara tells him that they're just changing bands and comments that he seems to have no experience in listening to rock music. Gamlin tells him that he's been forced to listen to it a couple of times, without any choice really. Gamlin is referring to the times that Basara had been singing to them during battles. Gamlin asks if Fire Bomber had played already. Basara tells him that they had played already and were pretty awful. Mylene asks him what that was all about and Basara tells her that Gamlin seems to be a fan of theirs. Mylene teases him that maybe he should give him his autograph. As a new band starts playing on stage, a protodevlin Vampire suddenly fires his Spiritia collector at the saxophonist, forcing him to collapse from the life force drain. Mylene shrieks that there is a Vampire near the stage. Basara and Gamlin leap to the stage. Gamlin tries to wake up the saxophonist while Basara runs after the vampire. A security guard approaches Gamlin and he orders the guard to seal off the ship and allow no one to leave as there is an enemy infiltrator on board. Mylene recognizes Gamlin as the person her mother arranged a Omiai with and wonders why he is here. Gamlin races after Basara then when he catches up to him he recognizes him as the person he is looking for. He asks Basara what his relation with the military is. Basara however tells him that he doesn't know what he's talking about. Before the conversation can continue further, Gigil attacks the ship without any orders from Lord Gepernich. Gigil orders his troops to attack the Mark Twain ship while some will go after the escape pods. A lackey tells him that they have detected some of their people on board the ship but Gigil tells them to just continue with his plan. On the way to the hangar, Gamlin keeps badgering Basara on what branch of the military he belongs to but Basara answers that he's part of the band Fire Bomber. He asks him why he goes out to sing during battles but Basara tells him that its none of his business. He continues pestering Basara then Basara tells him that he just wants to find out how far he can take his music. Gamlin asks him what he means by that but by that time Basara had already blasted off in his Valkyrie. Basara starts firing his speaker pods at the enemy Battloids then sings to them "My Soul For You." Lt. Kinyruu tells Gamlin to hold the line as they are still a few minutes away from the battle area. Fire Bomber and the rest of the civilians are hoarded into escape pods. Gamlin keeps the protodevlin Battloids away from collecting the spiritia of the people in the escape pods while Basara just sings to them and dodges their fire. Gamlin tries to contact him and tells him to use his Valkyrie to fight off the enemy, but Basara does not respond. One enemy Battloid is able to grab hold of the escape pod that Mylene and the rest of Fire Bomber are in and tries to get their Spiritia. Gamlin however is able to destroy that battloid and puts himself between the escape pod and the attacking battloids. Mylene watches helplessly as Gigil and some other Battloids overwhelm Gamlin. Basara comes in to put himself between Gamlin and the attacking protodevlin. Basara however just uses his pin point barrier shield to keep off the enemy's fire. Basara tries to fight off the temptation to fire his missiles as the ferocity of the attacks increases. He finally gives in when one of the rockets gets past them and explodes near the escape pod. He fires a rocket that takes off one of Gigil's Battloid's legs. He rams Gigil and gets mad and shouts at him that he forced him to shoot. Gigil is about to shoot Basara when he gets fired on by Diamond Force and the rest of the fighters of Macross 7. This forces Gigil to retreat. Gamlin tells himself that he owes Basara for saving his life. Gamlin is in the hospital, recovering from the wounds he had obtained when his cockpit window got smashed. He is seen talking to Milia as he had apologized for having called off the date with Mylene because of his injuries. Milia assures him that it's OK and that it couldn't be helped. As he puts down the phone, he gets a knock on his room and Mylene comes in bringing him flowers. Gamlin asks her how he could help her and Mylene tells him that she heard he couldn't come to their Omiai so she came over instead. Gamlin apologizes for not having recognized her. Mylene tells her that she saw him yesterday because she was in Mark Twain and saw how bravely he fought. Gamlin asks her what she was doing in Mark Twain, but instead of telling the truth Mylene tells her that she was researching something for school. Mylene then tells him that this was a weird way of being introduced to one another.